Good Food Box liaison Elaine Moore and volunteer Suzan Cuddy. Our church is the depot for the Good Food Box program under the leadership of Elaine Moore. Orders can be taken Wednesdays from 10 a.m. to 2 p.m. at Marmora Pentecostal Church. Orders must be paid by the first Wednesday of the month and will be available for pickup the third Wednesday of the month. The Good Food Box program is offered in partnership with the Community Development Council of Quinte based in Belleville. The GFB program offers everyone the opportunity to purchase fresh fruits and vegetables at a low cost. Helping you to eat healthy and save money too. The Good Food Box comes in two sizes: $15 for the large box of mixed vegetables and fruits and $10 for small box of mixed vegetables and fruits. Also available is a bag of mixed fruits for $5. For more information, please click on the brochure below. The Good Baby Box is open each Wednesday from 10 a.m. to 2 p.m. at Marmora Pentecostal Church. The Good Baby Box program is designed to allow anyone the opportunity to stretch your baby supply budget by purchasing items for your child at a reduced cost. The Good Baby Box is available for $6.50. It includes 20 diapers (from newborn to Size 6) plus one specialty item... Wipes, shampoo, powder, Zinc cream, pacifiers, baby wash, baby soap, bubble bath, baby lotion, Vaseline, etc. We also offer access to infant formula at a reduced cost as a nutritious alternative to breast milk for parents who are unable to, or have chosen not to, breastfeed. 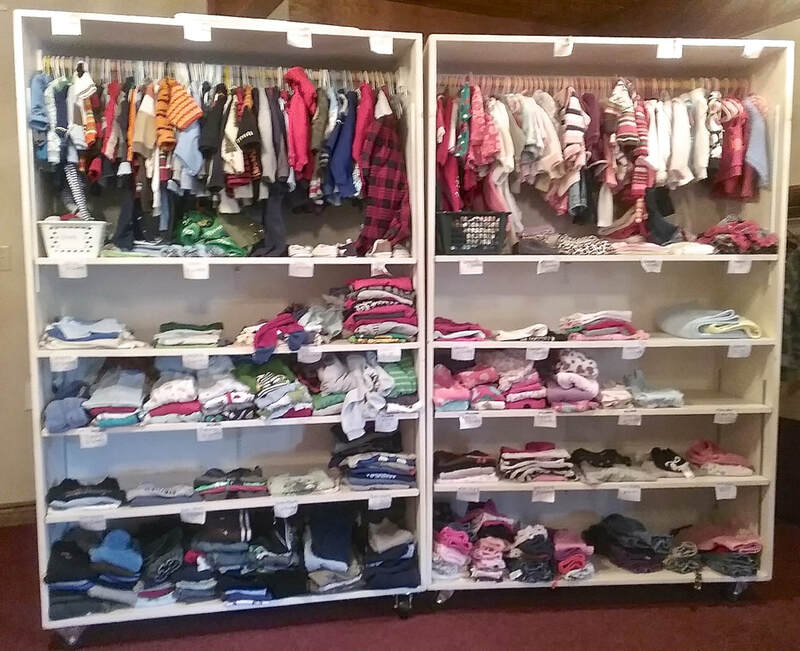 ​The kiddie closet (shown right) offers free clothes from infant to toddler and is available to all.